To contact a specific ApexNetwork Physical Therapy, please select the location you wish to contact. Now offering Certified Hand Therapy at our Collinsville, IL and Granite City, IL locations! For more information on hand therapy, please visit our services page or call (618) 651-0444. 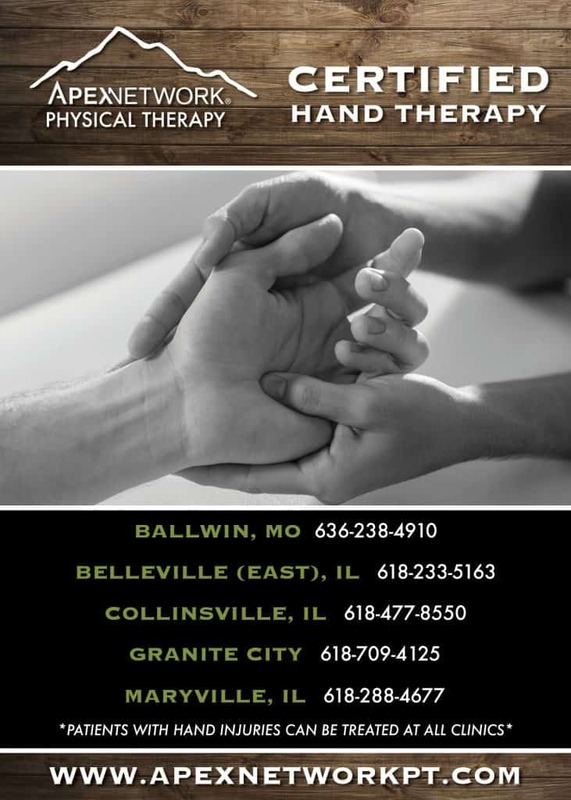 Certified Hand Therapy Now Offered At Collinsville & Granite City! To contact a specific ApexNetwork Physical Therapy®, please select the location you wish to contact. What does your shoe crease tell you? ApexNetwork Physical Therapy continues to expand throughout the country with appealing business models that focus on quality of care and business. © 2019 ApexNetwork Physical Therapy. All Rights Reserved.